UPDATED: Wed., Jan. 10, 2018, 3:57 p.m.
PULLMAN – After a three-game skid to open Pac-12 Conference play, the Washington State Cougars head into the second week of January looking to rediscover their form and find some momentum. Perhaps nobody else in the conference has more of both of those things at the moment than the Cougars’ next opponent. The Stanford Cardinal didn’t have much of either throughout nonconference play, posting a 6-7 record with a pair of Big Sky losses along the way. But they arrive in Pullman for Thursday’s 6 p.m. tip at Beasley Coliseum with a 2-1 Pac-12 record after a few dramatic wins last week at home. Stanford dug deeply to upset UCLA 107-99 in double-overtime last Thursday, handing the Bruins their first Pac-12 loss. It gave the Cardinal their first win since Dec. 17. But wait until you hear about the encore. Three days later, against a surging USC squad that began the season ranked No. 10, Stanford produced one of the top highlights of this young college basketball season. The Cardinal and Trojans were deadlocked at 74 when USC guard Jordan McLaughlin slashed to the rim and flipped in the go-ahead layup with 1.7 seconds to go. 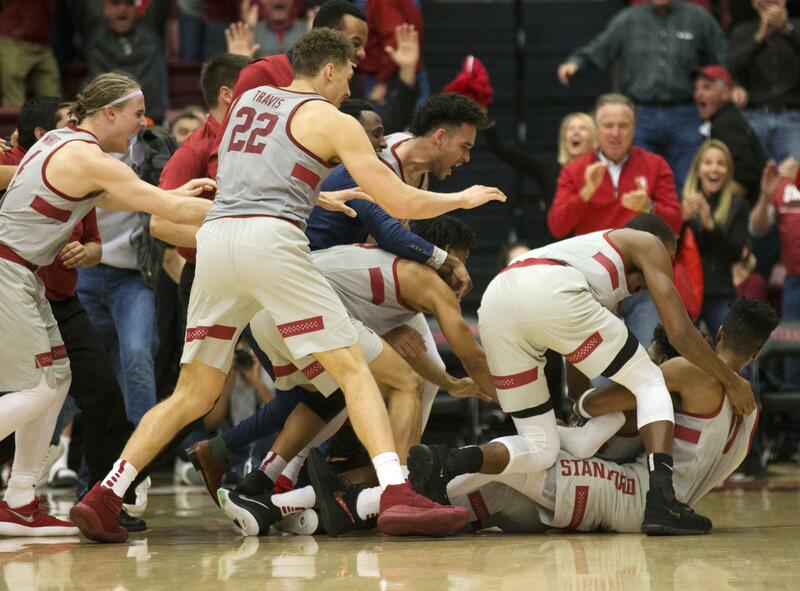 Stanford’s Daejon Davis received the inbound pass, stopped just shy of the timeline and launched a half-court shot as the buzzer sounded to cap a wild 77-76 Cardinal win. “That finish was crazy,” WSU forward Jeff Pollard said. “First of all, the USC bucket to go up and then the half-court shot to win it. It was obviously big play after big play. WSU (8-6, 0-3) will have to labor to slow down Reid Travis, one of the country’s most robust big men at 6-foot-8, 245 pounds. Travis’ scoring average (21.4 points per game) is second in the Pac-12 and he’s hit double digits in each of Stanford’s 16 games this season. Travis is tied for eighth in the conference with 7.6 rebounds per game. Michael Humphrey, a 6-9, 245-pound senior, could also pose some low-post challenges for an undersized WSU team. He averages 12.2 points and is the third-leading rebounder in the Pac-12 at 8.4 boards per game. Last week’s hero, Davis, is a true freshman guard from Seattle and one-time Washington commit who flipped when the Huskies fired longtime coach Lorenzo Romar. Davis played at Garfield High under former head coach and current WSU assistant Ed Haskins. It’s the second time in less than a week that Haskins will see one of his ex-Garfield players. The Huskies’ Jaylen Nowell scored an efficient 15 points in UW’s 70-65 win over WSU on Saturday in Pullman. Published: Jan. 10, 2018, 3:39 p.m. Updated: Jan. 10, 2018, 3:57 p.m.